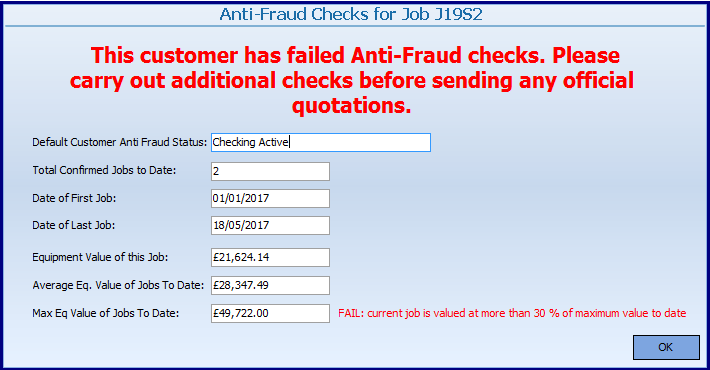 Anti Fraud – How HireTrack NX can help reduce the chance of a fraudulent hire. Fraudulent hires and theft within the hire industry is something that seems to have increased over the past few years. In 2016 alone, a total of $8,757,818 of professional motion picture camera equipment was reported stolen in the USA. To try to combat this. the industry has set up services in the UK, such as Xhire to report frauds and Azule keep a register of stolen equipment or Rental Guard from ESTA for the rest of the world. However these are both “after the fact” – far better to stop the fraudulent hirer before they get any equipment. Clare Cooney at Progressive Broadcast, Glasgow has put together a useful checklist to help deal with unknown hirers, but what about the professional fraudster – they may do one or two small hires to build your confidence and develop a rapport before carrying out their planned fraud. To help combat this, HireTrack NX has a unique anti-fraud warning system built in. Once switched on, the HireTrack NX anti-fraud module will monitor your jobs and warn you if something looks out of the ordinary. It does this by a series of calculations based on the value of the equipment being quoted, compared to the value of the equipment on the biggest job you’ve done for this client, as well as checking how this job compares to the average job. If the threshold is crossed, then the warning is displayed and the job shouldn’t proceed until a supervisor has reviewed it.